GENIZA EXHIBITION: A BRUSH WITH HISTORY: Conserving the Geniza Collections. A fascinating video on the nuts and bolts of conserving the manuscript fragments of the Cairo Geniza. Produced in association with the Discarded History exhibition at Cambridge University, on which more here and links. Start there also for links to the many, many past PaleoJudaica posts on the Cairo Geniza. HT Peter Gurry at the ETC Blog. EUANGELION BLOG: E.P. Sanders on Paul’s Life, Letters, and Thought (Michael F. Bird). E.P. Sanders, surely one of the most significant NT interpreters since the late 70s, has published his life and thought of Paul. It is not quite a Pauline biography but certainly not a Pauline theology either. More of an extended sketch of Paul’s life and thought as known from his letters. Despite the impression that the typesetting and binding were done on the cheap in a Bangladeshi print shop, it is quite an enjoyable read. There is nothing groundbreaking and no bold new claims from Sanders, but it gives Sanders’s overview of Paul, and what I enjoyed most of all is that something of Sanders’s own personality shines through- you feel like you are getting to know him. IN NOVEMBER: Museum of the Bible prepares for DC opening (Jennifer G. Hickey, Fox News). The $500m museum opens in the autumn and seems to be on a publicity campaign. It and the associated Green Collection have not been without controversy. Background on both is here and many links. What Does Documented Evidence Tell Us about the Transmission of Authoritative Texts? Thus bringing our Septuagint bibliography into 2017. Go to the post for descriptions and links. NEWS YOU CAN USE: Jim Aitken’s Reading List for LXX Studies (Jim West). Because you should know these things. BIBLE HISTORY DAILY: Discoveries in Mary Magdalene’s Hometown. Four ritual baths unearthed in the Magdala excavations (Marek Dospěl). The bulk of this essay is on Mary Magdalene and her home town Magdala, which may or may not be the site called Magdala that is now being excavated. Be that as it may, the site has produced some wonderful things. Not least among these is the "Magdala Stone" on which more here and links. And follow the links there for stories on the site of Magdala in general. The end of the BHD essay finally gets to its real news: the recent discovery of the four mikvaot (mikva'ot). To read more about them you need a subscription to Biblical Archaeology Review. Some past PaleoJudaica posts involving ancient mikvaot in Israel are here, here, here, here, and links. DR. JASON M. H. GAINES: Poetic Laws (TheTorah.com). A fresh look at the legislation in Parashat Kedoshim: Are we reading the legal details wrong? Poetry in Leviticus? Who knew? MOTIVATIONS: How Jews and Arabs Collaborate on Antiquities Theft in the West Bank. Thousands of artifacts are being stolen every year and making their way into Jewish hands, yet the Israeli division responsible for theft prevention has just one inspector to cover 2,600 sites (Yotam Berger, Haaretz). Interesting article. It infers quite a bit from the law of supply and demand, but perhaps not implausibly. It also introduces the claim, which is new to me, that the looters have an ideological motive to destroy any Jewish connection to archaeological sites. I don't know what to make of that one. Again, read the article now before it goes behind the subscription wall. Or you can read a limited number of premium Haaretz articles every month with a free registration. Some recent PaleoJudaica posts on antiquities looting in Israel and the West Bank are collected here. POLITICS: Why Does Trump Want to Address Israel at Masada? The famous fortress is about pageantry, and specifically the pageantry of the underdog (Sigal Samuel, The Atlantic). The article speculates about President Trump's motivations for choosing this venue for the main speech of his upcoming visit to Israel. But it also gives some background on Masada and the importance of the story of its fall in Israeli culture. Some of the many, many past PaleoJudaica posts on Masada are collected here. If you’re interested in experiencing the complex mix of thoughts and emotions I felt in that moment — challenged and stymied, satisfied and frustrated, amused, annoyed, tingling with a sensation so unnerving you might even call it hope — then pick up “Stranger in a Strange Land: Searching for Gershom Scholem and Jerusalem,” a new book by George Prochnik. To describe it as part biography and part memoir is to miss the point; it is instead a hunt through the crevices of one life in search of clues that might unlock the mysteries — intellectual, religious, political and psychological — of another. One has to wonder if the title of the book is meant to evoke Valentine Michael Smith as well as the biblical Gershom. BIBLIOGRAPHIA IRANICA: Treasury Secretary at Persepolis. Notice of an article posted on Academia.edu: Stolper, Matthew W. 2017. “From the Persepolis Fortification Archive Project, 6 The Dossier of Šarbaladda, Treasury Secretary at Persepolis.” ARTA: Achaemenid Research on Texts and Archaeology, no. 001 (2017): 1–33. This article is a collection of material concerning a single clerk working in ancient Persepolis. Despite its narrow scope, it is of some interest in that he seems to have been a sepīru, a scribe who wrote in Aramaic primarily on leather. We know of such scribes, but the humid climate in Iraq and Persia has obliterated all (as far as I know, without exception) of the ancient parchment documents they produced. Any details we can learn about them are welcome. By contrast, we have endless thousands of cuneiform tablets from the same region, because baked clay lasts for many thousands of years. Technically cuneiform tablets were produced by tupsharru (tablet) scribes, although it is hard to tell how much overlap there was between the two types of scribe. Learning to write Aramaic script was easy, whereas learning to write documents in cuneiform was difficult and took years to master. More on ancient Babylonian scribes here. Cross-file under Aramaic Watch. LARRY HURTADO: Two Recent Books on Coins. The two books are: Coins and the Bible, eds. Richard Abdy & Amelia Dowler (London: Spink, 2013) and Judaea and Rome in Coins 65 BCE – 135 CE, eds. David M. Jacobson and Nikos Kokkinos (London: Spink, 2012). The conference that led to the publication of the second volume was noted here and here. And there was a day-conference on Coins and the Bible at the University of Edinburgh last weekend. Regular readers of PaleoJudaica will be aware of the importance of ancient coins for our knowledge of ancient Judaism. Cross-file under Numismatics. ANCIENT ORIGINS: 4 Completely Different Versions of the Story of Moses (Mark Oliver). And all four are quite different from the stories in the Bible. These are the accounts of Moses by Manetho, Strabo, Artapanus (n.b., not Atrapanus), and Tacitus. Mithras temple uncovered in southeast Turkey? ARCHAEOLOGY: 1,700-year-old temple reveals ancient religion in east Anatolia (Daily Sabah). The report is that a 4th century CE temple of Mithras has been uncovered. There isn't a lot of detail about how they reached that conclusion. Mithraism was an ancient mystery religion that was in some competition with Christianity in the early centuries CE. There is another report in Hurriyet Daily News: Underground Mithras temple discovered in Diyarbakır. This one has more details, but also some obvious errors. It can't decide whether the temple is 1700 years old or 700. The proper term for a temple of Mithras is a Mithraeum, not a "Mithraea." And Mithras was a god, not a goddess. So be cautious with the information in the article. The discovery of this new Mithraeum is at the Zerzevan Castle in the Diyarbakır province in southeast Turkey. The discovery of an ancient Christian chapel there, which had Aramaic inscriptions on its walls, was reported back in 2015. Background here. Past PaleoJudaica posts involving Mithras and Mithraism are here, here, here, here, and here. THE LIBRARY OF CONGRESS: Manuscripts in St. Catherine's Monastery, Mount Sinai. This collection includes photographs of 1687 manuscripts that were photographed by the Clark expedition in 1949. They are in Greek, Syriac, Georgian, Coptic, Armenian, Arabic, Ottoman Turkish, and Ethiopic, and Old Church Slavonic. The images have been digitized and placed online for free. HT Peter M. Head at the ETC Blog and Brice C. Jones. Saint Catherine's Monastery has been in the news recently with a report of what may have been a narrowly averted terrorist attack on it. Follow that link, and see also here and links, for much additional background on the monastery and its precious collection of manuscripts. And for many other manuscript digitization projects, start here and follow the links. CONGRATULATIONS TO PROFESSOR ANNETTE YOSHIKO REED, who will be moving from the University of Pennsylvania to take up a post at New York University in the Fall. THIS WEEK'S DAF YOMI COLUMN BY ADAM KIRSCH IN TABLET: Caveat Emptor. In this week’s ‘Daf Yomi,’ Talmudic sages ask what it is safe to assume in matters of transactions within the law, and what must be specifically proven. The discussion moves into b. Bava Batra 6, which explores the obligations of buyer and seller. The sages did not accept the principle of caveat lector, "buyer beware." THE VOTE WAS 22 TO 10: Unesco passes resolution criticising Israel's annexation of east Jerusalem. The move drew further condemnation from Israelis, but was celebrated among Palestinians (Tareq Haddad, International Business Times). You can pretty much guess who voted which way. I have linked to the full text of the draft resolution here. Follow the links there for further background on this and other recent UNESCO resolutions involving Jerusalem and the Temple Mount. MEMBERS ARE LISTED AT THE LINK: Museum of the Bible Announces Formation of International Advisory Council (Gospel Herald). Some names regular readers of PaleoJudaica may recognize include Seymour (Sy) Gitten and Emanuel Tov. For past posts involving the Museum of the Bible and the Green Collection, see here and here and many links. TRAVEL ADVISORY - AGAIN THIS YEAR: Terror warning for Djerba Lag B'Omer celebration. Counterterrorism Bureau sharpens current travel warning for Tunisia following terrorist motivation increase to attack Jews. A synagogue has reportedly existed at the same site on the island of Djerba since antiquity, but I have not been able to locate any sources or evidence so far. The current synagogue has been there since the 19th century. There have been similar terrorism warnings for Djerba at Lag B'Omer in the last couple of years, but everything proceeded safely nonetheless. Let's hope for the same this year. Background here, here, here, here, and links. TABLET MAGAZINE: THE AFTERLIFE OF RABBI AKIVA. An excerpt from Barry W. Holtz's new biography of the 1st-century sage of the Talmud. Past PaleoJudaica post on the book are here and here. CONTROVERSY: ISRAEL TO UNESCO: REJECT FAKE HISTORY ON JERUSALEM. A day prior to a UNESCO vote in Paris on a resolution that rejects Israel's sovereignty in Jerusalem, Israel's Deputy FM Tzipi Hotovely called attempts to promote the resolution "fake history" (Tovah Lazaroff, Jerusalem Post). "Tomorrow, even as we celebrate, UNESCO will be voting against Israel's right to sovereignty in its capital city, Jerusalem,” said Deputy Foreign Minister Tzipi Hotovely ahead of the vote which is slated to take place on the same day Israel marks its 69th Independence Day. "This is absurd. We have become used to the concept of 'fake news'. Well, welcome to 'fake history,” Hotovely said. The vague nature of the language could mean that the text refers to the issue of Israeli sovereignty over all of Jerusalem. Israel is concerned both by the language of the text and the public relations aspect of a UNESCO board disavowing Israeli sovereignty in Jerusalem on the country’s Independence Day. The Times of Israel has published the full text of the draft resolution: Full text of May 2017 UNESCO resolution on ‘Occupied Palestine.’ The cultural agency’s executive board slams Israel for ‘persistent excavations, tunneling, works and projects in East Jerusalem’. Background on this and earlier UN resolutions on Jerusalem and the Temple Mount is here and links. ANCIENT JEW REVIEW: Between Mesopotamia and Qumran: Cuneiform Literature and Jewish Aramaic Texts of the Second Temple Period (Henryk Drawnel). Observations on Aramaic Levi, the Enochic Astronomical Book, and the watchers myth. Another interesting essay for AJR's Aramaic month. Earlier essays in the AJR series on the Dead Sea Scrolls (in honor of the 70th anniversary of their discovery) are noted here and links. PHIL LONG: Reading Acts is Going to Israel. His itinerary follows. Sounds like fun. I wish Phil and his students safe travels and an informative trip. APPROPRIATE FOR ISRAEL INDEPENDENCE DAY: Celebrating the Hebrew Language (Jeremy Rosen, The Algemeiner). Where did the Hebrew language come from? When did it begin? What language does God speak? And, for that matter, what language did the snake use to converse with Eve in the Garden of Eden? Is modern Hebrew a development out of Biblical Hebrew, or is it really a new and different language? Questions such as these have challenged us for years. Once upon a time, the source one would turn to for answers would be Hebrew: The Eternal Language, by William Chomsky (a man world away from his son Noam, who has renounced Israel and Judaism). Now Chomsky’s mantle has been passed to Lewis Glinert — professor of Asian and Middle Eastern Languages and Literatures at Dartmouth College — a former Brit and, briefly, a teaching colleague of mine. His new book, The Story of Hebrew, is a brilliant, informative, readable and enjoyable romp through the history of Hebrew, from its earliest beginnings to the present day. It is a must-have for any thinking person’s Jewish library. Again, the origin of the term "Zionism"
ETYMOLOGY: Why Is Zionism Called Zionism? Theories for the origin of the word reach into long-forgotten eras of history, and the speculated origin in 'wild cat' isn't necessarily the most fanciful (Elon Gilad, Haaretz). Before 1948, "Zionist" meant support for the establishing of a Jewish nation state in Palestine. Since the State of Israel's establishment that year, it is taken to mean the preservation of the state as a Jewish nation-state. But before that, we must peer thousands of years into the past. The story of the word "Zionism" really starts, in the pre-Israelite period, before King David conquered Jerusalem from the Jebusites, according to the bible. Simply, "Zion" was the name of Jerusalem’s acropolis in the pre-Israelite period, around 3,000 years ago. That acropolis was in the part of the city that would subsequently be called “The City of David,” as 2 Samuel says: "David took the stronghold of Zion, which is now the city of David" (5:7). Later, during the Babylonian Exile, starting in 586 B.C.E., "Zion" morphed into a poetic name for the city of Jerusalem as a whole. With time, it became a poetic name for the Land of Israel as a whole, appearing in songs and prayers of yearning for the return to the land throughout Jewish history. I'm not sure how much we can rely on the biblical account of Jerusalem in the pre-Israelite period. And there's that odd episode about the priest-king Melchizedek to take into account too. See Genesis 14 and Psalm 110. But that's the information we have. In 1897, when Theodor Herzl founded the World Zionist Organization, he adopted the name and the rest is history. But what does the word "Zion" mean? We don't know. Scholars do not agree, but at least there is a multitude of theories to choose from. Once it was commonly claimed that the name is pre-Semitic, and some strange foreign etymologies were proposed, such as the Hurrian word sheya (“water”) or the Elamite word tziya (“temple”). Now most scholars agree the word is probably Semitic in origin: Archaeology indicates that Semitic peoples controlled the entire region for more than a millennium before the time of David. Various suggested etymologies follow. Again, read the article fast before it goes behind the subscription wall. Or you can read a limited number of premium Haaretz articles every month with a free registration. For additional discussion of the question see this recent post. ARCHAEOLOGY: How Arabs Made Israel’s Desert Bloom More Than 1,500 Years Ago. Israelis like to boast about their success in developing the Negev, but under the Byzantine empire, Christian Arabs were the first to turn the desert into a garden (Ariel David, Haaretz). The tiny olive grove sits atop a dry canyon in the middle of the Negev desert, surrounded by barren hills and a few wisps of withering vegetation. Despite the parched setting, the ancient, gnarled trees are alive, their branches heavy with green leaves and ready to bear fruit. Researchers believe these few trees, located a handful of kilometers outside the ruins of the ancient Byzantine settlement of Shivta, grew there through no fluke of nature. They may be among the last living witnesses to a complex civilization that built prosperous towns and farmed the Negev during the Byzantine period, more than 15 centuries before Zionists started imagining they could make Israel’s desert bloom. Fresh research is shedding new light on these Byzantine desert dwellers – who were they? How did they shape their environment to such an extent? And why they ultimately, and quite mysteriously, abandon the lands they had fought for so hard? Researchers say these questions are key not just for historians but for any society, including modern Israel, that wishes to develop and grow sustainably in an extreme environment like the desert. The Nomadic, pagan Nabateans (Nabataeans) converted to Christianity and settled down to become farmers in the desert. Then a few centuries later they disappeared. The regional capital, Halutza – once the seat of a bishop, public baths, churches and a theater – has largely been left buried under the sand, mostly due to lack of funds and frequent looting by local Bedouins. The second largest Byzantine town in the area – Ruheibe, also known as "Rehovot in the Negev" – has been partially excavated. But it is difficult to access, including because it is surrounded by an Israeli army firing zone. Still, archaeologists have managed to glean some information about the people who lived there, says Uzi Dahari, deputy director of the Israel Antiquities Authority, who in January published an article on research in Ruheibe in the Israeli journal Kadmoniot. The inhabitants worshipped in churches and wrote in Greek, the Byzantine empire’s official language. But the architecture of towns like Ruheibe – clusters of small houses and tight winding alleys to keep the sand out and provide shade – point to a local, tribal population, Dahari says. Read the whole article before it goes behind the subscription wall. Cross-file under Nabatean Watch (Nabataean Watch). Background here. THE BIBLE PLACES BLOG: Luke & Acts: Historical Reliability - 5 (Michael J. Caba). This post is on Lysanias, tetrarch of Abilene, mentioned in Luke 3:1. UPDATE: broken link now fixed. Sorry about that. The Palmyra Portrait Project was set up in 2012 by Rubina Raja and Andreas Kropp.1 As Syria has been in a state of war since 2011 and all field investigations have been interrupted, it is now undoubtedly the most interesting ongoing project focused on Palmyra. It consists of the compilation of a database of all known Palmyrene portraits scattered across the world, which is, unbelievably, still missing,2 and of the publication of Harald Ingholt’s archive and diaries, which hold important information about his excavation in Palmyra in the 1920s. Ingholt pioneered the study of Palmyrene sculpture in 1928, when he published Studier over palmirensk skultpur, which still stands as a milestone in this field. Palmyrene sculpture is the main topic of this book, but the epigraphic evidence is also relevant and is not neglected. Background on Palmyra, its history, the ancient Aramaic dialect spoken there (Palmyrene), and the city's tragic reversals of fortune, for now trending for the better, is here (cf. here) with many, many links. Cross-file under Palmyra Watch. THE HARVARD CRIMSON: Albert Henrichs, Scholar of Greek Literature, Dies at 74 (Archie J.W. Hall). Albert Henrichs, a globally-renowned scholar of Greek literature and religion, died April 16. He was 74. Born in Cologne, Germany, Henrichs was just 26 when he made his first major academic discovery. “He took four lumps of leather in a cigar case from Cologne through to Vienna, and gave them to the conservator there to try and unpeel them,” recalled Kathleen M. Coleman, a Classics professor. The earlier obituary was noted here. That article also covered the information on his fascinating publications quoted above. But this one includes additional information about his life and personality. I got my PhD at Harvard in the 1980s in the Department of Near Eastern Languages and Civilizations. I had some contact with Classics but, regrettably, I cannot remember ever meeting Professor Henrichs. Cross-file under Manichean Watch (Manichaean Watch). THE HOLY LAND PHOTOS BLOG: Cedars of Lebanon. There are still some left! The description does not specify whether this book includes dream incubations in ancient biblical and Jewish tradition, but arguably there are such. These would include Solomon's dream at the Gibeon sanctuary in 1 Kings 3 and Enoch's dream at the waters of Dan in sight of the holy Mount Hermon (1 Enoch 13-15). And see also this recent post on ancient Jewish dream visions. TECHNOLOGY WATCH: Radiocarbon dating gets a postmodern makeover (Emily Litvack, PhysOrg). For decades, radiocarbon dating has been a way for scientists to get a rough picture of when once-living stuff lived. The method has been revolutionary and remains one of the most commonly used dating methods to study the past. Charlotte Pearson says it's ready for a makeover. Pearson, an assistant professor of dendrochronology at the University of Arizona, studies the past lives of trees to better understand the history of civilizations. Dendrochronology and radiocarbon dating have intertwined histories, she explains, with roots firmly planted at the UA. I don't really see the title's "postmodern" element of the makeover, but more attention to the dendrochronological data may well give radiocarbon dating a more precise anchoring. According to Pearson, recent discoveries of large-scale "spikes" of radiocarbon in certain years have led to a growing need to revisit the way radiocarbon dates are calibrated. Radiocarbon dating, as of now, dates samples to within a few decades using a calibration curve made up of groups of ten tree rings plotted as series of single points on a graph. The points represent an average amount of radiocarbon present in those rings. This doesn't account for spikes in the data —individual rings with unusually high or low amounts of carbon-14. These spikes in radiocarbon can come from a number of short-term events, such as solar flares, volcanic eruptions and changes in oceanic circulation. By lumping 10 years' worth of radiocarbon data into a single data point, spikes in radiocarbon may inadvertently skew the curve, making dates less accurate. "Spikes are a potential limitation to how well the current radiocarbon calibration curve works, and we want to investigate that for time periods of archaeological controversy. But they also offer enormous potential to act as a sort of chronological anchor for our floating chronologies," Pearson said. With funding from the Malcolm Hewitt Wiener Foundation, Pearson is targeting a period in the Bronze Age from 2,400 to 1,400 BC, getting measurements of carbon-14 in single tree rings from a range of growth locations. What this reveals about yearly radiocarbon variation during this time period will then be applied to archaeological controversies and floating chronologies from the East Mediterranean and beyond. "Tree rings just record. They are impartial recorders of change over time. They have no bias, and they have no political agenda; they just stand at locations all over the world," Pearson says. "They capture a moment. We still have many discoveries, I believe, to make about what they can teach us." None of this is immediately relevant to ancient Judaism. But there is much potential. 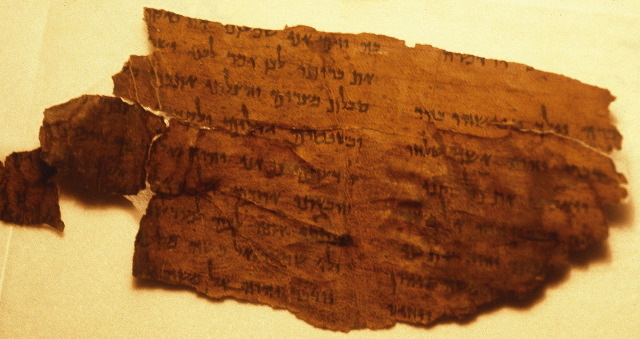 A more precise framework of radiocarbon dating could, for example, confirm or complicate the paleographic dating of manuscripts from the Second Temple period. THE OTTC BLOG: Zachary Cole on Greek Numerals (Drew Longacre). Zachary Cole has published a new book on Numerals in Greek NT manuscripts that sounds very interesting, including for those interested in Septuagint manuscripts. Published by Brill in 2017.